Many people ask me about a particular card in a Tarot spread they laid out the night or week before. What does it mean, what might it be trying to tell them and how should they apply that to their spread? I can’t answer those questions for people. Why? Because they never share the image of the card or the intent behind its placement in the spread. Many readers today think that the Moon card, for instance, means the same thing in deck A as it will in deck B. It doesn’t. It has a general category, but the meaning of the card is hidden within the images of that card. And since each deck is different, the message in the images will be different. Additionally, if the card is part of the Major Arcana vs. the Minor Arcana that will also have influence on the meaning and message of the card. In general the Major Arcana deals with the higher consciousness, the spirit, spiritual karma, lessons and the soul’s mission in this lifetime. Where as the Minor Arcana will be influenced by the physical aspects of day-to-day life. Your thinking process and perspectives and how those attract or repel energy around you. The only way to really explain this is to look at a card from four different perspectives. Within each of these cards, the only common theme is the card represents the Moon in the Major Arcana. They share elements, the Moon, wolf/dog, three of them share water. But beyond that, they’re different. And they show their message in four different ways. 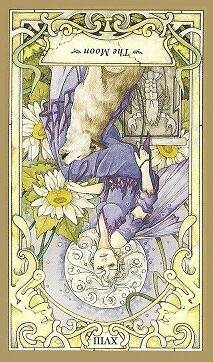 In the Druid Craft Tarot, the image reminds me of communication indicated by the wolves howling at the moon. 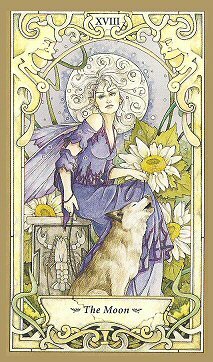 However the first impression of the image in the Moon Card by Edynae, is moving with the flow; which is indicated by the water flowing from her hand. From the Mystic Faery Tarot, I see Divine Light of Grand Mother Moon sharing her spiritual insight so I might say this one brings messages from spirit or are hidden in spiritual wisdom. And the tried and true Rider-Waite Moon contains both a journey and danger as one travels their path of spirit. Are you walking your path blindly or are you applying your beliefs to practice and learning from experience? The details within the message behind a card resides in your first impressions of the images you see. Anyone can lay out the moon and read from a book that says the Moon means “this” or “that”. That’s not reading the tarot. That’s reading a book. The Tarot are cards used for divination. Where in that process did you divine a message? You didn’t, you read someone elses interpretation of what they saw. The message from the Tarot comes from within you and your connection to the energy of that card and your connection to the person or purpose you’re reading that card for. If you’re pulling a card for insight into the day, your connection to the energy of the day and the Divine force in your life are where the message will come from. The images in the card are there to help you visualize that energy you feel and Divine a message for others to understand and comprehend. The only thing you need to remember from the book is the general area of energy that resonates within each suit. The suits of the deck depict the fabric of life, the actions and values of existence. The Minor Arcana is separated into four groups, each group depicts an overall essence of life, physical issues or events that can be impacted by spiritual or manifested energy. The following are the most common groups in a tarot deck and how they relate to the modern playing deck. WANDS = Clubs Represent the essence of Enterprise & Inaction, Inspiration & Pessimism, Distinction & Disregard. They can also represent Magik, or manipulated energy. CUPS = Hearts Represent the essence of Emotions & Apathy, Happiness & Despair, Abundance & Lack. SWORDS = Spades Swords represent Strength & Weakness, Endurance & Struggle, Respect & Animosity. They can explain the fight going on or suggest peace is the best path to success. Each time you see that same card, the images you see will be different. It will mean something different upside down as opposed to right side up because your perspective of the same images are different. Don’t assume upside down means negative or bad energy. It could simply mean struggle is involved or there’s something working against the situation. It could mean something is coming to an end or is in it’s final stages of manifestation. Or it could even mean you need a new perspective on the situation at hand. So look at things from a different angle and you’ll find a different insight. Here’s a quick example. Each time you look at a card, allow your eyes to focus on the very first thing it sees. Try to describe that part of the image, and move your vision out a little to see what’s around that section and if it provides any additional insight. Keep doing this, until you see the entire card. The Moon Upright – Let’s say the first thing you focused on was the large Daisy in the Fae’s lap. Now use your psychic connection to the Divine and interpret why that has meaning. I might say, Even at night flowers bloom and reflect the light around them. Use that as a gift to shine your light upon others who are in the dark and can’t find their way. How did I get to that message? Some of it is understanding the card, but most of it is from gut feeling and Divine connection, which is the whole purpose to “Divination”. I see a large white flower blooming under the moon light. The Moon tells me its dark outside, the full moon is reflecting it’s light on the white petals of the flower. The flower is in the lap of the fae and looks to me as if it was a present or gift. By her side is a wolf howling. In this situation, the wolf “feels” like he’s crying, he’s in distress and needs help. Put all this together and I see a Fae who understands that even in the darkness under the moon, there are lessons to discover and light to shine upon the darkness to reveal the solution. The Moon Inverted – Here the first thing you might see can be as small as the Fae’s hand reaching for the box she’s sitting on. But upside down, that part of the image may give the impression of holding on. In this case I might say, Be careful reaching out and hanging onto something you don’t need in your life. You may be unaware of the dangers and cause more harm than good. How did I get to that message? In this instance the hand looks to be struggling to hold onto something. The Lobster coming down to the hand is danger that might pinch the fae as she struggles to maintain her grip.We could move out to see the tattered and torn sleeve which could indicate the turmoil and constant fight to maintain a situation. But look at her lap at what appears to be tatters falling from her dress. No matter how hard she tries to hold on, the situation is in tatters and dangerously falling away.If we pull out farther, now we can see the wolf howling. Do you see someone trying to warn you? Or do you see a little one who is being affected by the constant conflict of battle. What you “feel” in your gut is the answer to the question. Never be afraid to ask the question. And it’s ok to say “I think” or “I feel it means this, but you may know something more than the card is telling me” and then tell someone what you think. There isn’t a psychic alive today or who has lived in the past that is 100% accurate. Divination is feeling energy patterns and trying to visualize how those patterns have been formed, what they represent now and how they may manifest tomorrow or next week or whenever. Everyone has free will and choice and the purpose of attaining Divine information is to apply it to situations you want to change or feed the energy you want to continue to manifest. At most, a good experienced reader is only about 75 to 80% accurate. Some of that has to do with our own blocks or perspectives. The experiences we’ve been through and how well we can push our energy out-of-the-way to feel and pick up the energy surrounding a person or purpose. The better you are at clearing the energy and connecting to your client or a situation, the more accurate you can be. But underlying all that is the ability to trust yourself and your instincts. The moment you start guessing what you sense, and changing what you say, is the moment you fail the test. Believe in yourself. Say what you “feel” don’t second guess it, don’t try to sugar coat it. Sometimes you may receive a message that someone else needs to hear with brutal honesty. Of course there are good and bad ways to share such messages; but those ways aren’t something one can teach, they come from experience through compassion and kindness. The other component to reading a card is the intent of that card when it’s drawn. The intent can be everything and overshadows the entire message. Did you pull a single card for a daily insight? Did you pull three cards to lay in a Past/Present/Future spread? Was this for a situation in your life? Or for a client and a situation in their life? Each one of these things will hold its own form of energy around the images and what the message means. Keep that intent in mind as you view the images and allow their message to share the visionary aspect of the energy with you. What Deck Do I Start With? Anyone first learning to read the Tarot should start with the Rider-Waite Deck. It is the quintessential authority on the tarot. When you find your deck, look through the book. Learn the suits and the areas of influence they impact and then put the book in a drawer. You need to connect with the images of the card; not with what someone else says the card means. Use this deck for a minimum of 1 year, 2 or 3 at the most. No one says you have to move to another deck, but if you become bored you’re going to lose your connection with that deck you’ve been reading. Change occurs in all things in life and sometimes to keep your interest, you need something new. Go shopping for a new deck, but make sure you look for one that contains a great deal of imagery and one that you feel drawn to. Here’s an example of four different decks. While the Tarot Lovers Tarot is beautiful, it lacks the imagery I’d like to see in a deck. It’s the perfect example of the kind of cards I’d recommend staying away from. Rider-Waite is simple and doesn’t add a lot of imagery to confuse or distract a beginner. The Druid Craft and especially the Gilded Tarot are exactly what I’d like to see as illustrated examples of a good deck for any level of reader. Whatever deck you choose, you’ll want to handle it for at least 30min a day, every day for about two weeks. Shuffle it, play with it and hold it. You don’t have to lay out a spread; but at least get your energy and especially the oil from your skin on to the entire deck. You’re doing this to make it yours, to put your energy into the deck and make a connection with it. Once you do this, no one else should touch it but you. Some people say they have their client cut the deck for a reading so their energy is imprinted on the cards. I don’t care for this option. The connection to the deck is between you and the cards. The connection to the client is between you and that person. Adding their energy to your deck could muddy the waters when the next client comes in for a reading. Think of it this way, the Divine is your connection to the energy surrounding the client and the situations they’re concerned about. The cards are your tool for divining the information from this connection. So you are the center force between the Divine energy information and the client. The cards are your tool to help you visualize that energy into a message for the client. They don’t need to touch the cards. When the deck becomes saturated with too many energy signatures, it must be cleansed and reconsecrated. Then you get into all the processes and requirements of cleaning and clearing the energy between clients so that person’s energy doesn’t impact the next persons energy and so on. Its all a big mess after that. So keep your cards to yourself. When you’re first starting out, it’s best to read for yourself or someone you know in person. First because you can receive feedback from others that will help you build your confidence. Or you can strengthen your connection to the person and learn more about how you can best connect with someone to pick up on their energy. Because that’s what you’re reading. The cards are simply help you see that energy and giving you a mechanism to speak what you feel. There are people who say a real reader can’t read over the internet. Well maybe they can’t, but that’s not true for everyone. Energy is not contained by a building, distance or even a computer screen. If you’ve practiced and built your ability to reach and feel subtle energy of another person, it doesn’t matter if they’re present, on the phone, over the internet or all the way around the other side of the world. The question is, do you believe you can connect with someone who is not in your presence? Then you’re at the starting point for making a connection when ever and where ever you need to. Readings generally provide information that is uplifting. There maybe a need for brutal honesty. But spiritual readings will always guide you to provide hope and faith of a positive outcome. It may not be what the client hopes it to be, but rather what they need it to be. How you deliver the message is a lesson that’s learned. But it’s important to remember that all readings should end with empowerment. And when you’re aware of that, you will find the right message to deliver from the cards. Storing your deck is one of the most important things you can do between uses. You want it safe, away from prying eyes and in natural materials. That’s wood, not plastic. Cotton or silk, not polyester. Keep them in a place where others won’t feel drawn to look at them or play with them in your absence. If that’s an issue where you are, consider a wooden box that you can lock. But consider animals in the house as well. Nothing is worse than coming home from work and finding the cat or dog has eaten your favorite deck of Tarot. Yeah, I’ve been there. Twice even. As sometimes happens, a card can go missing in a Tarot Deck. But don’t throw away the entire deck and think you can no longer use your favorite cards. Sort the deck to discover which card is missing. There could be a message for you in that situation. Laying out a spread can become problematic in these cases. But there are solutions. Today many decks include extra cards for information or decoration. 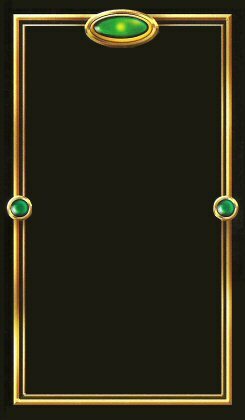 Some even include blank cards for the very purpose of replacing a lost card. Find a Sharpe marker and write the name of the missing item on the extra card. You could even find a picture of the missing card and tape or glue it to the extra card so you still have an image to view. The internet being what it is these days, you’re likely to find an image of the card you lost. Try to size the image to print on a color printer with a good quality stiff paper stock. Once printed, take another card from your deck, trace its outline over the printed item and cut it to size. It’s a good opportunity to have some quality adult coloring time with your replacement card. I have a friend who printed a missing card on regular paper and then laminated the item. She then cut the replacement to the size of the other cards in the deck. There’s a lot of things you can do to replace a missing card. However….if you’ve lost more than three cards in a single deck, I’d suggest replacing the entire deck. It’s obvious the energy of the current deck isn’t meant for you at this time in your practice. Time to find a brand new and different deck to take your skills to the next level. When Should You Change Decks? If you do a lot of readings, there’s going to come a time when your favorite deck wears out and needs to be replaced. The last thing you want to do for a reading is use a deck with taped up cards that have ripped or fallen apart from extreme use. It’s not good for the reading and it’s not good for the messages you’re trying to receive. And if you do a lot of readings, there’s going to be times when you’re bored with the current deck. Take these moments as a sign that it’s time for a change. Change is good, it keeps your skills evolving, growing and expanding. It’s fun and exciting. It’s good to have fresh perspectives and open new doors to more adventures. This is exactly how you should approach your Tarot decks. How often you perform readings may depend on how often you should replace your deck. If you read on a daily basis, you might want to change every year. Generally Samhain’s New Moon is a good time for swapping out the old for the new. But don’t think you have to use only one deck at a time. No one said you’re limited to a single deck in your practice. If you’re like me and you’re constantly doing readings, you might have several decks. Deciding which one to use for a reading session depends on the energy of that moment. Or the energy of who or what you’re doing the reading for. You’re psychic, use your gut instincts to decipher which deck is best to use for this moment in the here and now. Then trust your instincts! As an example, the deck I’m most comfortable with right now is the Mystic Faery tarot. But it’s a very feminine feeling deck to me. So when a man comes to me for a reading, I often feel drawn to a different deck. Something like the Gilded tarot or the Steampunk tarot usually grab my attention. Visualize yourself connecting to the client or situation you’re pulling the card or cards for. See yourself looking at the energy involved from outside its manifestation so you have a better view of it and see the other groups of energy it might be connected to or influenced by. This allows you to see both the trees, plants and animals in the forest, along with the terrain around the forest all at the same time. Above all else, trust yourself. Listen to your instincts when you go shopping for your deck. Ask your guides to help you choose the best deck for you. And even if you have decided on which deck, there maybe one or more boxes at the store to select from. So don’t think you have to take the one-off the top. You decide which of the boxes of Rider-Waite you want to have as yours. Then welcome it and take care of it. It will take care of you in return. We offer both in-house and email/phone/Skype consultations. As a Ministerial organization, all our consultations are private and strictly confidential. 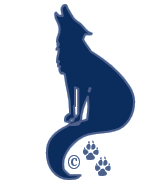 © 2014-2016 Springwolf, D.D., Ph.D. Springwolf Reflections / Springs Haven, LLC. All Rights Reserved. Sometimes, a used deck is good, but only if it has come from an advanced reader or from someone that you know and trust. It is usually superb to determine somewhat regarding cards by way of studying a couple of posts about easy charge cards plus outdoors outside patio’s. These are all situations that we may have had to suffer through without any guidance. I don’t have a problem with any kind of used deck, regardless of who it comes from. All decks, I believe, should be cleansed and cleared of unwanted energy and that’s true for new and used decks. If you’re going to do that with new decks, than any used deck should doubly go through such cleansing and charging by it’s new owner. The best teacher of tarot is right here! And this article is the proof anyone needs to see it. Excellent article to teach others how to actually use the Tarot for what they were meant for. Divination. Put the book in the drawer and read the cards!